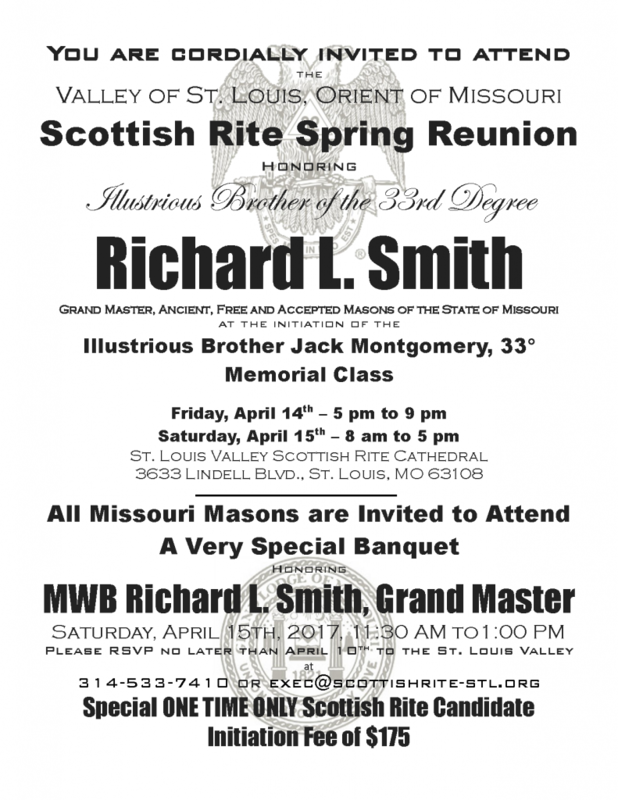 Read the Latest Scottish Rite Journal and Missouri Insert Online! 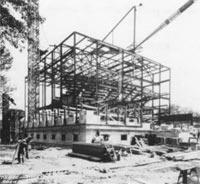 We hope that you enjoy the latest addition to the Missouri Scottish Rite website! You can now read the latest issue of the Scottish Rite Journal including the Missouri insert online! This bimonthly publication of the Supreme Council, SJ USA is available by clicking the image of the front-cover of the magazine or Missouri insert shown below. *note* Once you click the cover, it may take a few moments to load, so please be patient, particularly on mobile. You’re cordially invited to participate in this special event as a sponsor, as an individual shooter, or by sponsoring a group of five for your organization. Awards will be given to the highest scoring teams and the top individual shooter. First time shooters are welcome and encouraged to participate. All proceeds from this event will help support the CLDC’s mission to provide relief and assistance to children suffering from and afflicted with Aphasia, Dyslexia and other speech, language and hearing disorders and conditions. The KCSR Childhood Language Disorders Clinic is tax exempt under section 501 (c)(3) of the Internal Revenue Code, operated in partnership with Children’s Mercy Hospital. Details: Shooter registration includes, lunch & drinks, 12 or 20 guauge shotgun shells and clay targets. There will also be awards, door prizes and premium raffle drawings. Contact Dan Woehrman at 816-810-0927 or Dan@CallenderPrinting.com for more information. The Kansas City Scottish Rite Foundation cordially invites you to the Inaugural Kansas City Scottish Rite Foundation Night. We will also dedicate the Frank S. “Dad” Land Masonic Library and Museum and anticipate a few exciting surprises connected with this! Fundraising Dinner followed by a Charity Auction and the Library Dedication. $25 per person will include a Grilled Steak Florentine, Smashed Seared Spuds w/ Cheddar Bacon & Chives, Orange Candied Carrots, Stewed Green Beans w/New Potatoes, Fresh Tossed Salad w/ Parsley Lemon Vinaigrette, Fresh Baked Breads, Strawberry Pie w/Fresh Whipped Cream, Apple Pie. *Net proceeds from the Dinner will go to the preservation of the Kansas City Scottish Rite Temple. Please RSVP ASAP by calling 816-561-2277! Below please find links to the Missouri DeMolay letter and forms for the 2017 Missouri DeMolay State Conclave. We appreciate your kind assistance in this most worthwhile venture and look forward to having you with us at our 2017 Missouri DeMolay State Conclave over the Memorial Day weekend in Jefferson City. It has been the tradition that each Valley donate for a $500 full page. You can certainly do more if you desire. It would also be great to have the Valleys and any and all of you to be a Sponsor. Join us for this historic occasion as we open the time capsule from our original Kansas City Scottish Rite Temple. Scottish Rite Members may also take part in a discussion of VMAP from 4:30 to 6pm led by two well-known employees of the Supreme Council. 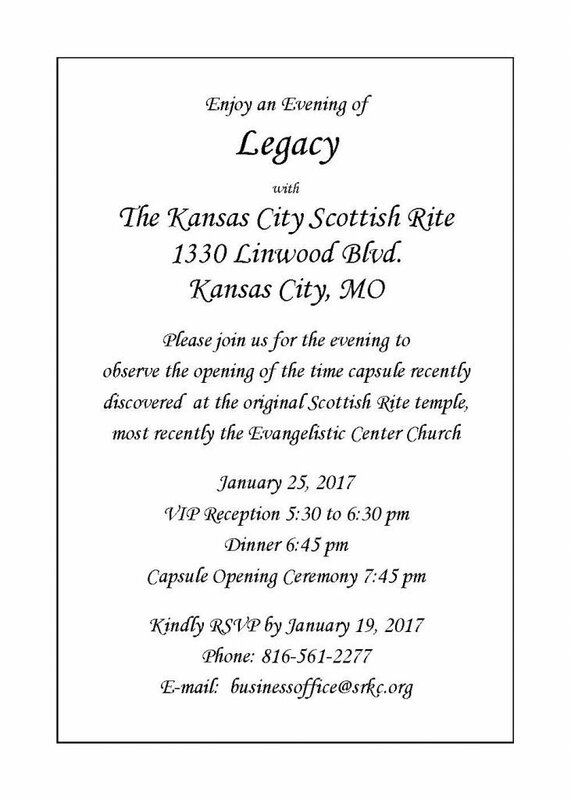 Join us for this historic occasion as we open the time capsule from our original Kansas City Scottish Rite Temple.